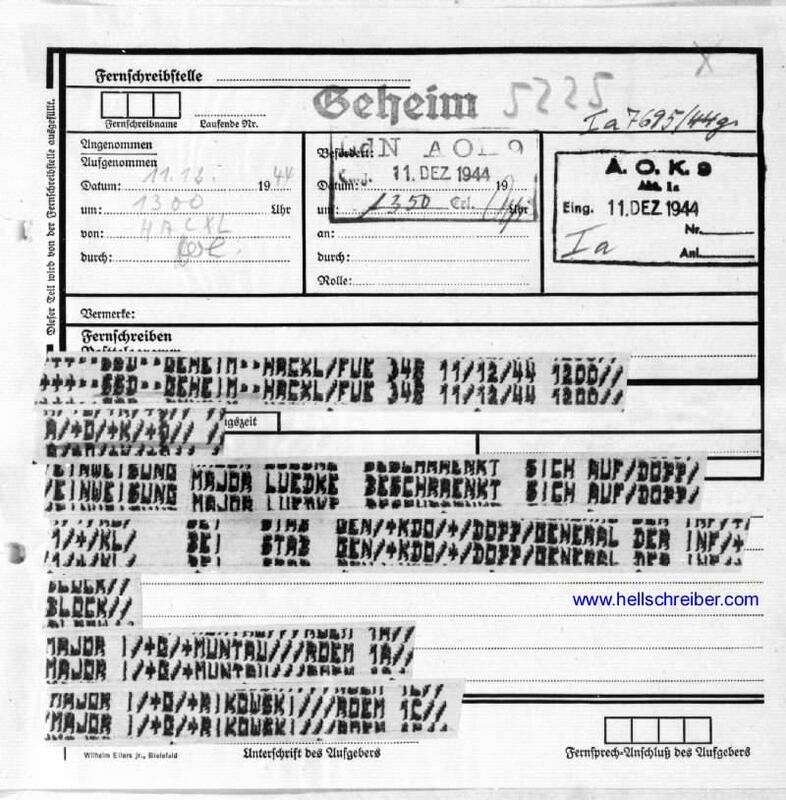 Over the years, I have collected copies of Feld-Hellschreiber telegrams from World War 2. They are shown below in chronological order. 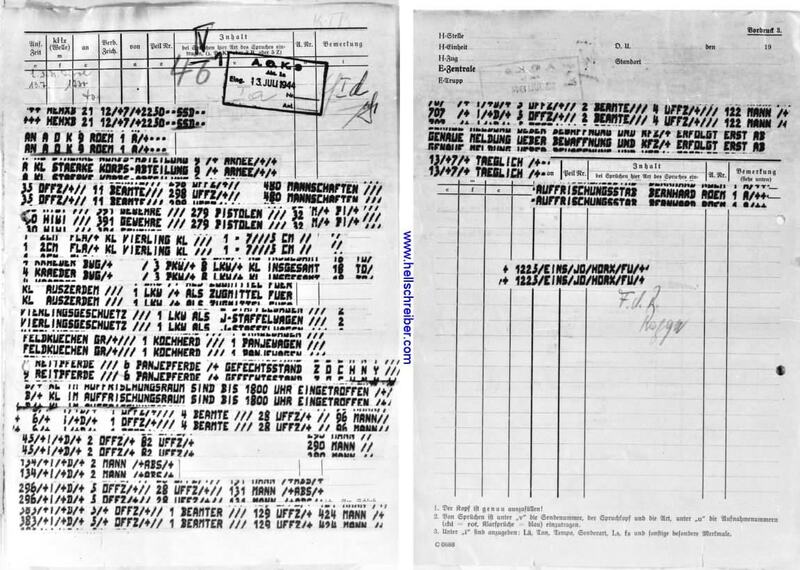 Several examples of telegrams printed with Siemens-Hell start-stop machines (T.typ.72 "GL", T.typ.73 "AGL", and T.empf.39 "L") are on this page. 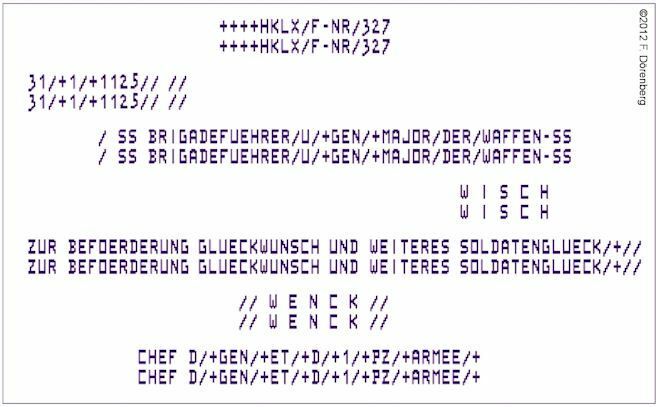 The Hellschreiber message below (originally encrypted with a Lorenz SZ40 "Enigma" machine) was intercepted by the British at Bletchley Park, on 14 August 194, on 6408 kHz. 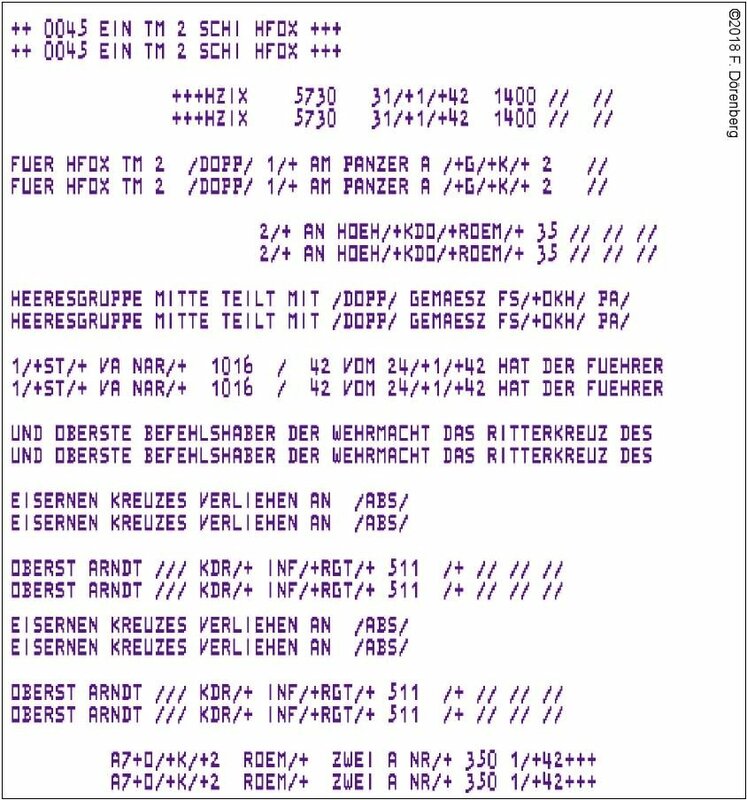 It is from a transmission between the German stations in Vienna and Athens. 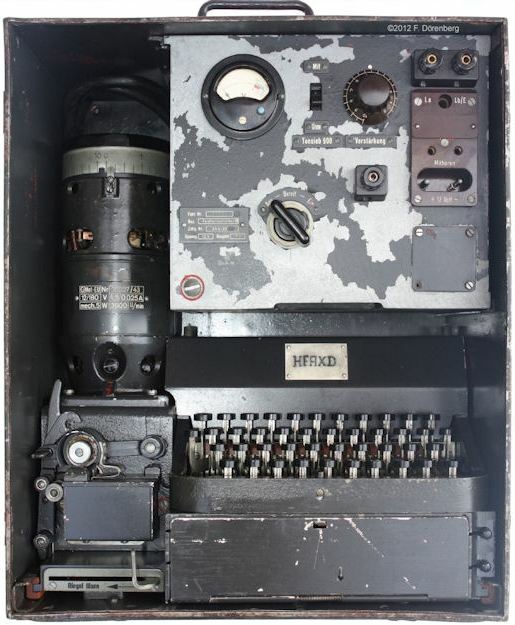 Intercepted messages were glued onto a "W/T Red Form" sheet (W/T = Wireless Telegraphy). The picture to the right shows that the form is actually red, to indicate its secret nature. 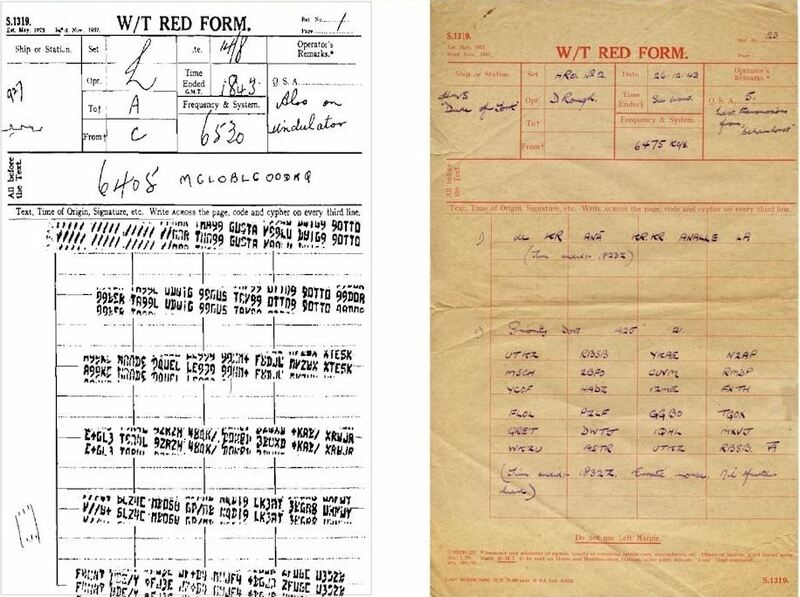 This particular "Red Form" has an intercepted encrypted Morse-code message from 1943 - the last transmission from the German battleship "Scharnhorst", before it was sunk. Ref. 2, 3, 4. The Feld-Hell telegram below is dated 1 February 1942. It is a telegram from the Heersegruppe Mitte (Army Group - Center) that fought on the eastern front (Soviet Union). The telegram is a notification that the Führer has awarded the Knight's Cross of the Iron Cross to colonel Karl Hermann Arndt (1892-1981). At the time, Arndt was Commander of the 511th Infantry-Regiment (through 10 January 1943). He later became Generalleutnant (lieutenant-general) and was also awarded the "Oak Leaves". "situation at 16:00 hours - fighting continues, several Stukas fought off by our artillery". On 21 Sept 1943, the Acqui Division was decimated by the German troops, esp. by the notorious Gebirgsjäger Regiment, who had been ordered to not take any prisoners. During the fighting, over 1200 Italian troops were killed. Some 5000 were killed off after their surrender. This event is referred to as the Acqui Massacre or the Cephallonia Massacre. On September 24, General Gandin and his staff were executed by the Germans. The Feld-Hell telegram below is dated 13 November 1943. 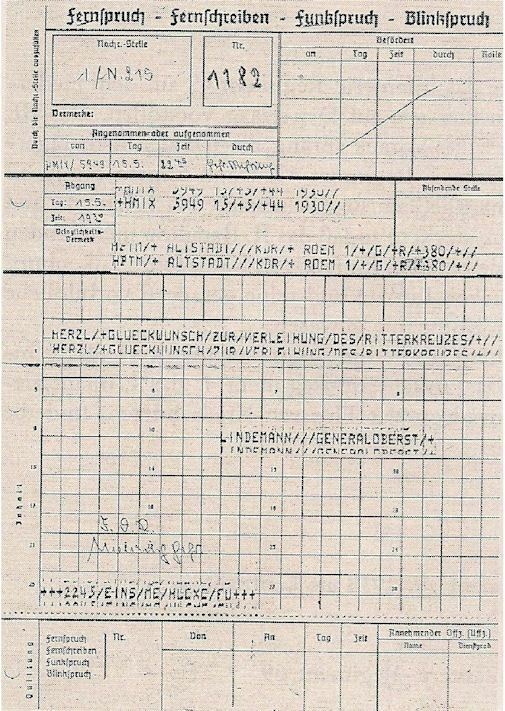 It is a telegram from Generalfeldmarschall Erich von Manstein of the Heersegruppe Süd (Army Group - South) to congratulate Corporal Günther Bartsch with being awarded the Knight's Cross of the Iron Cross. Bartsch belonged to Nr. 2 Company, 110 Panzergrenadier Regiment, 11th Panzer Division, 47 Army Corps, 8th Army (1st Panzer Army), Army Group South. 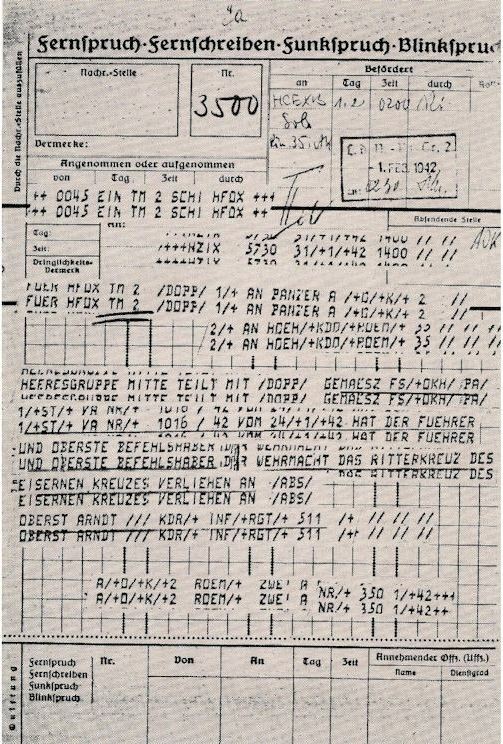 The Feld-Hell Fernschreiben (telegram) was sent on 31 January 1944 by General Wenck to Major-General Wisch, congratulating the latter with his promotion. General Wenck was Chief of Staff of the 1st Panzer Army and youngest general in the German Army during WWII; Major-General Wisch was Commander of the 1st SS Division LSAH. The Feld-Hell telegram below is dated 15 May 1944. It is a telegram from Generaloberst (colonel-general) Georg Lindemann of the Heersegruppe Nord (Army Group - North) to congratulate Major Rudolf Alstadt with being awarded the Knight's Cross of the Iron Cross (nr. 3118). Alstadt belonged to 1st Battalion, 380 Grenadier Regiment, 215 Infantry Division, 28 Army Corps, 18th Army, Army Group - North. 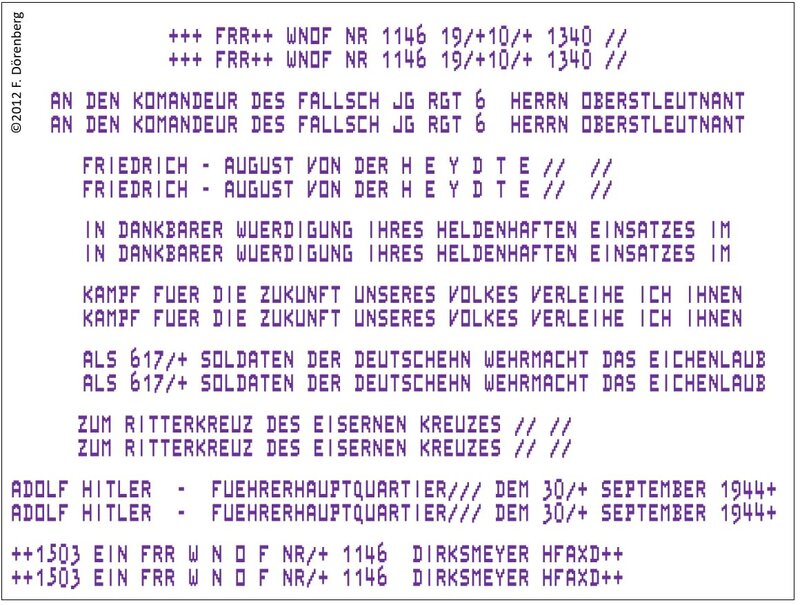 The Feld-Hell telegram below is dated 12 July 1944. It is a telegram prepared at 22:50 and sent the next day at 12:31 by station HORX to station HEHXB of the 9th Army/Army High Command (9. Armee/Armeeoberkommando, AOK 9). Starting 5 July 1944, this Army was involved in Operation Citadel ("Unternehmen Zitadelle") - the Wehrmacht's third and final summer offensive in the Soviet Union. The offensive was called off by A. Hitler on 12 July 1944, ending the largest tank battle in history. The telegram lists the current strength of the headquartres battalion (officers, non-commissioned officers (NCOs), enlisted men, officials) and equipment (firearms, Flak cannons, field kitchens, cars, trucks (lorries), motorcycles, horses, horse-drawn carts). 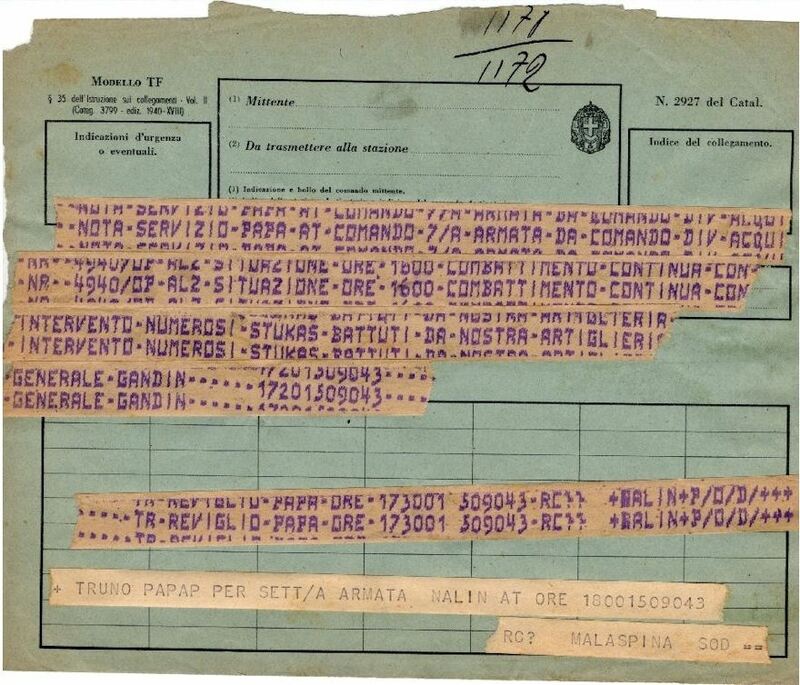 Below is a transcribed telegram of 15 September 1944, from the headquarters (Gen. Kdo.) of the 88th Army Corps, during the eastward retreat in Belgium. 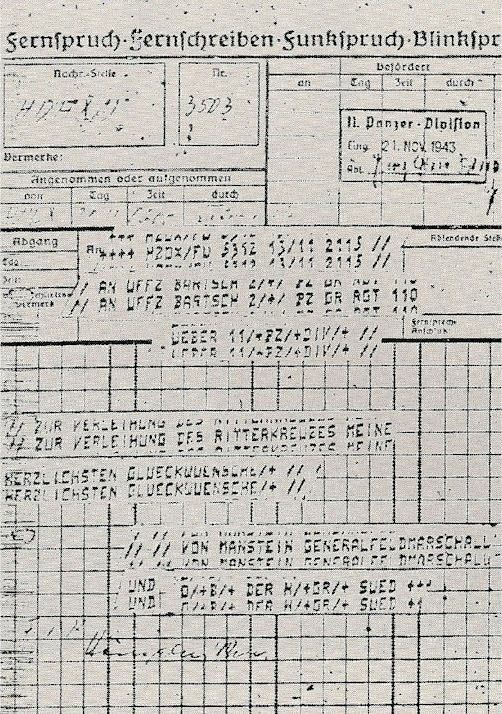 Part of the Hellschreiber telegram is attached. 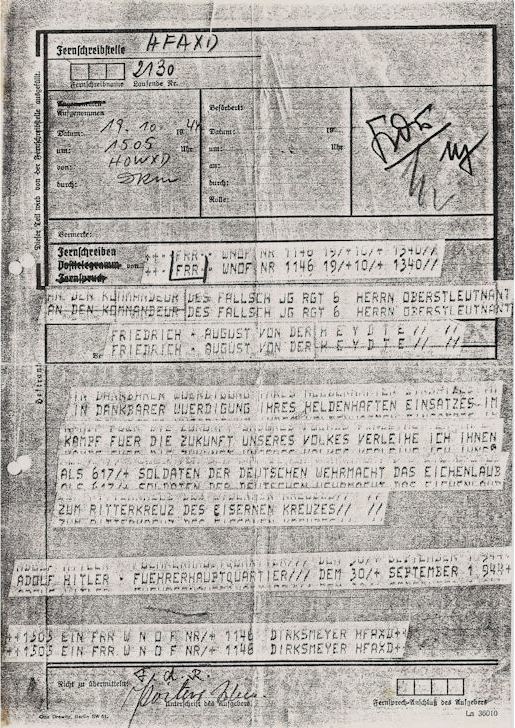 The Feld-Hell telegram below is dated 19 October 1944. It is a telegram from the Führer (FRR) A. Hitler (or from his office, on his behalf) to Friedrich August Freiherr von der Heydte (1907-1944), awarding the latter the Oak Leaves to his Knight's Cross of the Iron Cross. The award date is 30 September 1944. The Knight's Cross was the highest award for recognition of extreme bravery or leadership on the battle field. In total, only 900 "Oak Leaves" were awarded. The Feld-Hell telegram below is dated 11 December 1944. 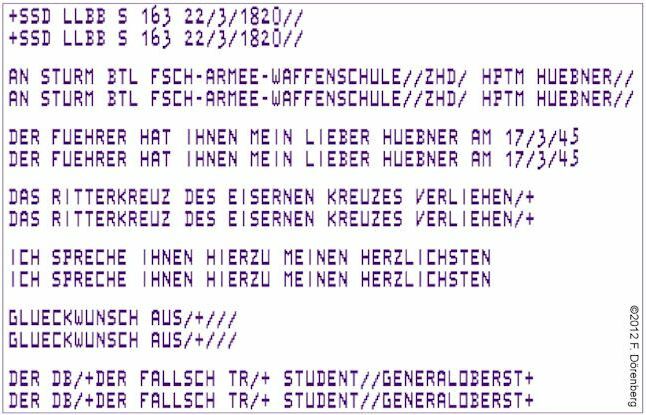 The telegram is classified as "SSD Geheim", i.e., "urgent message, secret". It was prepared at noon and sent at 13:00 to station HACXL. 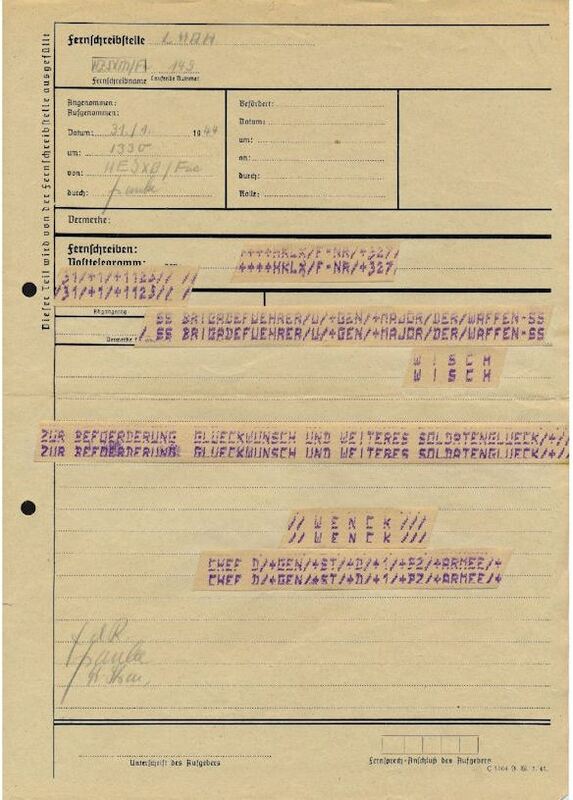 The short telegram is about the briefing of Maj. Luedke at the staff of Infantry General Johannes Block. It is signed by Maj. Muntau and Maj. Rikowski. The Feld-Hell telegram below is dated 22 March 1945. 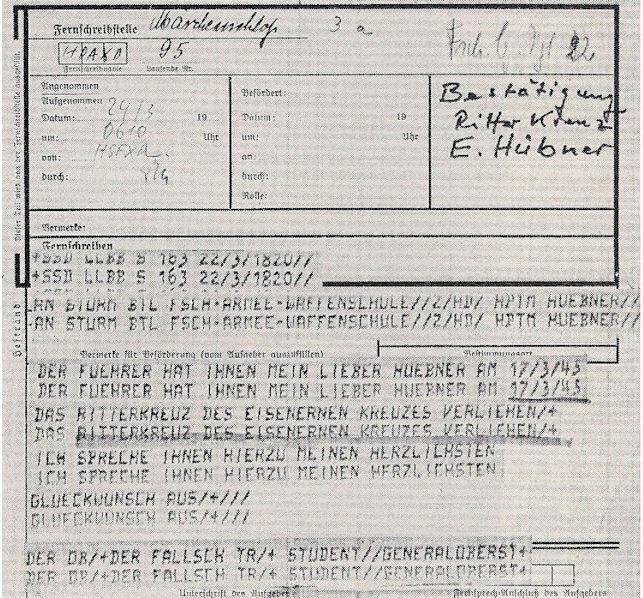 It is a telegram from Generaloberst Kurt Student to congratulate Hauptmann (Captain) Eduard Georg Hübner with being awarded the Knight's Cross of the Iron Cross on 17 March 1945. Hübner was Captain and Commander of the Stormbattalion of the Paratrooper Army, 116 Panzer Division, 47 Panzer Corps, 1 Paratrooper Army, Army Group H.
Ref. 1: "Der Typenbildschreiber Tbs 24a – 32", Rudolf Heinrich, 1940, 26 pp. Ref. 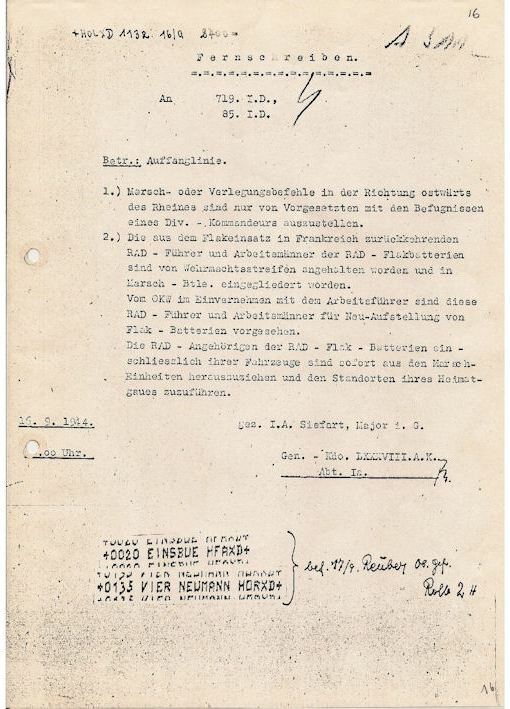 1A: here is the original German document, handwritten primarily in Sütterlin script (copyright Yuri Desyatnik; used with permission). Ref. 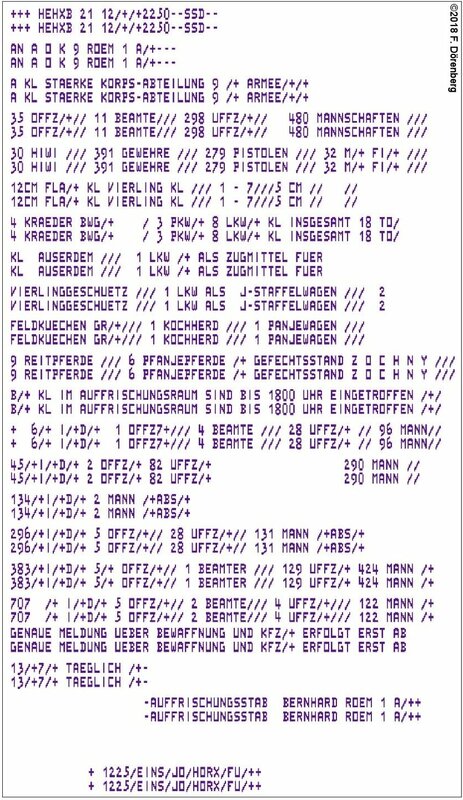 1C: here is an English version (the above transcribed German version, translated into English by me, Frank Dörenberg). Ref. 1D: for linguistically inclined readers, here is a version that has both the transcribed and the translated version, side by side. Ref. 2: "The "Tunny" Machine and Its Solution" (document partially declassified in 2007), John H. Tiltman, 15 pp. Ref. 3: "The Tiltman Break", Friedrich Ludwig Bauer, Appendix 5, pp. 370, 371 in "Colossus: the secrets of Bletchley Park's codebraking computers", B. Jack Copeland (ed. ), Oxford University Press, 2006, ISBN 019284055X, 462 pp. Ref. 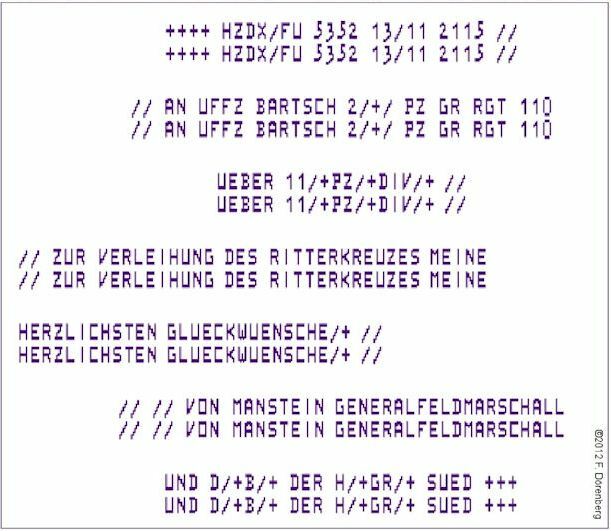 4: p. 388, 389 in "Decrypted secrets: methods and maxims of cryptology" [pdf], Friedrich Ludwig Bauer, 4th ed., Springer Verlag, 2007, 525 pp. Ref. 7: "Kriegstagebuch des LXXXVIII. 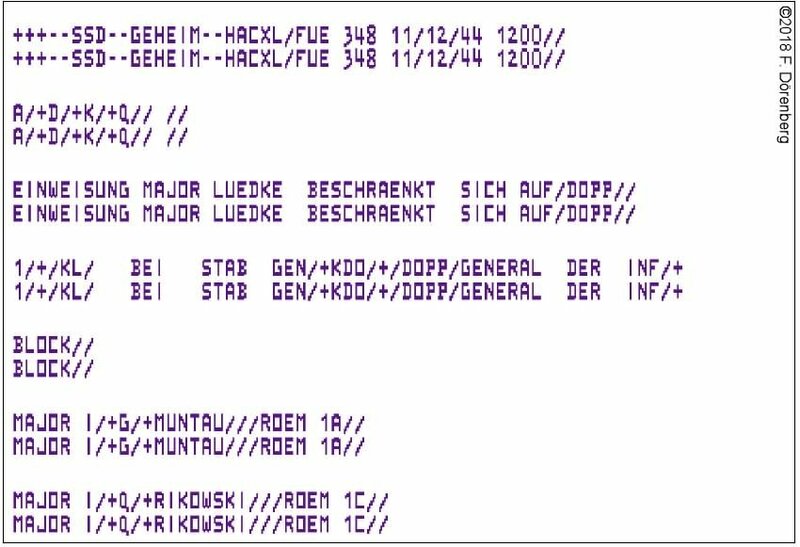 Armeekorps", Band 4, Teil 2, Anlagenband A (Appendix Vol. A to Vol. 4, Part 2 of the "War Diary of the 88th Army Corps"